Liabilities are the financial obligations of a company arising from the ordinary course of business. Liabilities are incurred and settled over operating cycles through the transfer of economic benefits which include, but are not limited to, money, goods or services. In layman’s terms, liabilities are the debts and obligations of a business that are incurred to keep the business running. Liabilities are recorded on the right side of the balance sheet and include accounts payable, accrued expenses, long term and short term notes payable, and deferred revenue. Liabilities can be categorized into one of two categories: current and long term (non current) liabilities. Current liabilities are categorized as debts or obligations due within one year. Long term liabilities are those liabilities that are due in excess of one year. However, there are liabilities that can be both current and non current. For example, a 5 year note payable would be classified as a long term liability but the principal payments due within one year are classified as a short term liability. Generally, you can tell a company’s long term and short term viability by comparing it’s long term and short term assets with its long term and short term liabilities. Companies with a higher ratio of current liabilities to current assets will have difficult with short term cash flow. This means the business will struggle to pay its short term bills when they become due. Additionally, companies with a large amount of long term debt will eventually have to pay back the debt with future earnings. If projected future earnings is dismal then it will be harder and harder to pay back long term debt obligations. Common examples of short term liabilities are accrued expenses and accounts payable. 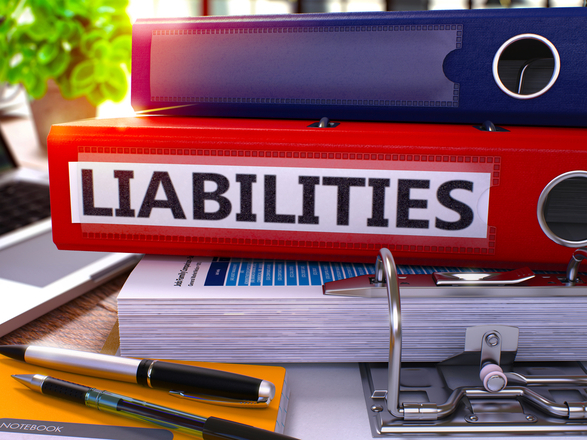 These short term liabilities constitute the operating expenses for a business. Essentially, accounts payable and accrued liabilities are the vehicles for recording expenses without recording a decrease in cash. For example, lets say Bob is renovating a bathroom for a customer. Bob does not want to pay for the cost of materials and supplies until he collects from the customer. To do this, Bob purchases materials and supplies on account and will pay the balance in full within 30 days. Even though Bob did not pay for the supplies and materials with cash he still has the obligation to pay for these expenses. Therefore Bob would record a liability and an expenses for the amount of the purchase. At the end of the 30 days Bob will pay the balance in full, reduce the liability to zero and reduce his cash by the amount of the payable. Below is an example of the liabilities section of the balance sheet. Notice how the the current and long term liabilities are separated. Bob purchased $500 worth of supplies on account, entered into a long term lease for $20,000, of which $5,000 is due within the year and paid $1,000 cash for equipment. Classify the above transactions as long term liabilities, current liabilities or neither. Long Term Liabilities: $15,000 ($20,000 total lease liability less $5,000 short term portion). Short Term Liabilities: $5,000 current portion of long term lease and $500 accounts payable). Neither: $1,000 purchase of equipment would be classified as a fixed asset.